Maxcuatro braid fishing line, from PowerPro, shaves down diameter without losing one iota of strength. So along comes Maxcuatro, and the good folks at PowerPro send me a spool to test out. Without even reading the box I start spooling up, and strangely, it seems to take longer than usual to fill the reel. What gives? 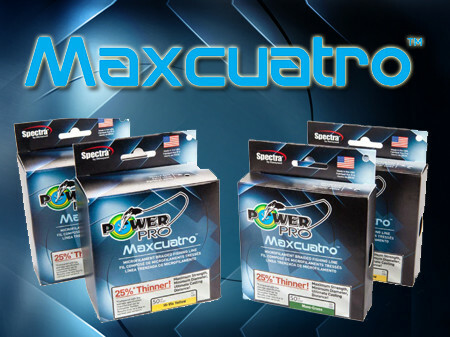 With Maxcuatro, they’ve shaved off yet another 25-percent of line diameter for the same pound-test as compared to existing PowerPro. That means the reel I’m filling, which held 300 yards of line, now will hold 400 yards. Sweet. PowerPro also says that “4-End” construction makes the line lighter and softer, and as a result you get longer casts. I’m not sure I’m entirely sold on this and after using the line for a few trips, I’ll say that’s a definite maybe. But it really doesn’t matter much, because, did you hear me say this stuff is 25-percent thinner? That means it’ll be easier to cast than the same previous pound-test, regardless. Maxcuatro comes in moss green and hi-vis yellow, in 50, 65, 80, and 100 pound tests, and in spools of 150, 500, 1,500 and 3,000 yards. If you want a thinner line that’s just as strong—and who doesn’t?—check this stuff out.